As you all know I'm a huge fan of the Cocoa Brown products and the brand that Marissa Carter has built up over the last couple of years. Back in September I attended the Cocoa Brown #PassionPersistencePink event where Marissa Carter revealed the new Cocoa Brown bronzing gels in Matte and Shimmer. You can read my review of the #PassionPersistencePink event here and you can read my review of the Cocoa Brown bronzing gels here. 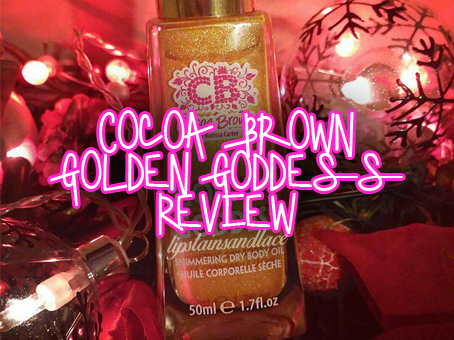 For months I was waiting for the release of the Cocoa Brown Golden Goddess Dry Body Oil and when it hit the shelves a couple of weeks ago I went to Penneys almost every day until I could finally pick up a bottle for myself! I loved the look of how shimmery the oil was and I couldn't wait to put it to the test. And what better time to put a sparkling shimmery product to the test than over the festive season. First I used the Cocoa Brown Tough Stuff to exfoliate and prep my skin before applying the Cocoa Brown Chocolate Whip moisturiser. I then applied the Cocoa Brown matte bronzing gel all over using my Cocoa Brown double sided Pink Velvet tanning mitt and I put some of the Golden Goddess body oil on my collarbones and down the front of my legs as well as a little on my arms to make me shimmer. The Cocoa Brown Golden Goddess Body Oil has the signature Cocoa Brown scent of Tahitian Gardenia (which I adore). The oil itself is just so shimmery and it's absolutely perfect for any time of year because well.. who doesn't love a bit of shimmer? The oil itself is non greasy and dried pretty quickly which I was super impressed with. Golden Goddess is also super affordable at only €11.95 compared to other body oils out there at the minute. A little goes a long way with this product and you can use it as a highlighter with your makeup to give you glowing skin or you can use it all over your body to give you gorgeous shimmering skin. I found this perfect over the Christmas season for nights out and I just know I'm going to be addicted to using it in the summer months. You can buy Cocoa Brown products from Penneys stores, in pharmacies nationwide and from selected stockists online.